For more than a week the Ukrainian parliament has been trying to pass legislation aimed at tackling the financial crisis, but with no luck. However, when the danger of losing a multi-billion dollar loan loomed, the political infighting was put aside. “The IMF is a technical organisation. We do not have any conditions related to politics. We need to know that the authorities are ready to implement the policy measures that they have agreed to. And we are satisfied that the Ukrainian authorities are ready to do so,” Balázs Horváth from the IMF commented. For almost a decade Ukraine has enjoyed not rapid, but steady economic growth. It’s less than a year ago that the country started experiencing high inflation, but after the financial crisis struck, things have become even worse. Almost half of Ukraine’s GDP relies on exports, so according to economists the worldwide market collapse will bring crippling effects to the economy. Many talk of a possible economic default. “Just a few months ago Ukrainian steel cost $US 1100 per ton. Now it’s just $US 250. It’s less than half the cost of production. That’s because most construction projects where Ukrainian steel was being used have been halted. No construction means no need for the export of steel,” he said. The main question is how the IMF loan will be spent. 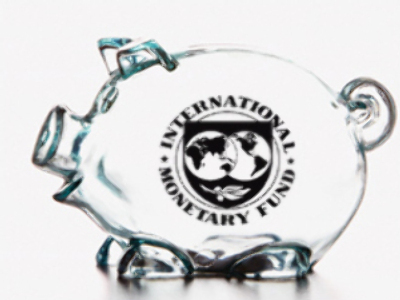 Authorities say the IMF loan is aimed at strengthening the financial sector, but experts believe it is industry that needs the money. “There will be massive losses in any case because we do not expect exports to improve in 2009. This loan will only help us to have a less painful fall, like a pillow. But when the economy is falling from such a great height, you can’t think of a pillow which can save it,” said Zholud. Also for the time being the country is still due to hold an $US 80-million snap election in December, which could reshape the political landscape. So it’s unclear who eventually will be in charge of putting the money to use.